What we’re interested in is the political function of the creation of public space in a social housing neighborhood in Grenoble, France. 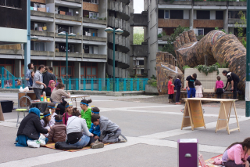 During its practice of social pedagogy in street workshops, the association Mme Ruetabaga is able to create a space that is radically open, where groups form and unform over a period of two hours every week. The workshops lay the basis for a form of prefigurative politics (Ince, 2012, Springer 2013) in an area generally to be perceived as anomic (Dubet, 2008). This example provides an alternative view to both the pessimism of the death of public space and the utopian idea of mass movements challenging global capitalism such as proposed by Lefebvre and Harvey. The focus is on the everyday, the mundane, the micro and how they can sometimes produce extraordinary situations. 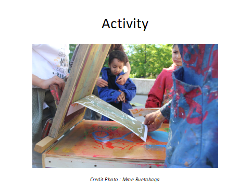 The first part of the presentation will discuss the dynamics at play in public space in Villeneuve, a neighborhood just across from the geography faculty. The second will discuss the enabling dynamics put in place by Mme Ruetabaga to increase the publicness of public space over the time of the workshops. At last we will argue in what way this space is political. The work presented here is a form of action-research. All three authors are volunteers at Mme Ruetabaga and respectively working or living in the neighborhood. 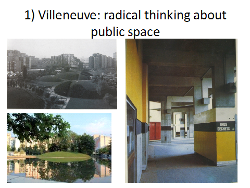 Villeneuve was built as a modern utopia in 1960’s but over the years it has lost a lot of its attraction which coincided with a rising percentage of social housing and residents of immigrant origin, postcolonial and more recently from Eastern Europe. In the administrative jargon, the neighborhood is called “sensitive” and it is part of the French state’s cartography of special intervention zones that require specific attention in terms of security and other types of urban policy targeting the lowest income areas. Its negative reputation is known nation-wide as a result of the violence that occurred over the last years. Most of the time however, the neighborhood is calm and on sunny days it is even quite paradisiac with its 14 hectare park, lake and hills. Villeneuve is the last large housing estate built in France. It fits within a tradition of post-WWII building: large scale constructions at low cost as a result of standardization and industrialization. They were rapidly criticized for their propensity to ghetto formation: mono-functional with minimal or no attention for landscaping, at the margins of cities and ill equipped in social transport. By the time VN was built this critique had been taken into account by Grenoble’s socialist municipality with large ambitions and a vision for the antithesis of the bedroom community. It worked together with an avant-garde group architects, artists and sociologists and engaged in citizen consultation. Progressive ideas about public space and the place of the child in the city were at the center of their reflection. Buildings have been constructed on pillars, thereby opening up the space under them for pedestrians; it is car-free; the high-rise architecture has liberated space for the monumental park; and facilities have been integrated in the architecture thereby creating a large publicly accessible area. a. Tensions between police and youth over the drug trade and the street as economic resource. b. Tensions around youth occupying halls and streetcorners as symbolic resource. c. Struggle over what is appropriate behavior in public space for women. d. Struggle over norms in public space and belonging. Further tensions in public space are over the right to “otherness” or difference, which have only increased since the 2015 terrorist attacks. What is normal and who has the right to impose one’s norms? Halal butchers, foreign products on the market, the hijab and people of color, make a part of the white French no longer feel “at home” in the neighborhood. For those belonging to visual minorities, on the contrary, this diversity serves as a security valve as it offers some kind of protection against racist looks and therefore provides a sense of security and belonging (Lapeyronnie; interviews). e. One of the struggles absent from the area is that between car and children. Children have a relatively large perimeter in which they can move without being accompanied by a parent, providing a sense of freedom in comparison to children living in the city center. 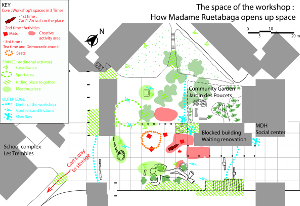 In the midst of these multiple tensions and conflicting claims on public space it is quite extraordinary that Mme Ruetabaga is able to invest a large area of one of the central squares of the neighborhood for its practice of social pedagogy. “Meeting people where they live, at the foot of their residences in order to learn, work build and struggle together”, that is what social pedagogy is all about. The association was created in 2013. Its name is a pun: In rutabaga, the French word for swede, we find “rue”, the French term for Street and so it became Mme Ruetabaga, placing the street at the heart of their action. May it rain or snow the workshops always take place in public space, following a strict principle of continuity all year round. They are free and require no condition to participate. In 2016, Mme Ruetabaga organises workshops in four different places of which the Square of Giants is one. While all age groups can participate in the workshops, the majority is between 3 and 14 years old. The number of participants can vary between 10 and 150. Mme Ruetabaga distincts itself from other pedagogical experiences offered by institutions (school, leisure centres, clubs, sports, libraries) that select, categorize, classify and survey access through doors, walls, financial contributions and administrative procedures. It insists on the pedagogical value of its activity which should not be mistaken for leisure. Its initiator in Grenoble, Melody Dababi, describes it as an answer to the shared problems of our times (Dababi 2012, p.12). The workshops have been born from a critique of the education system; of public space; of capitalism and in favor of a public that doesn’t find a place anymore in traditional institutions (Dababi, 2012). Parents indeed have complex relations with institutions and school in particular as a result of the disqualification, stigmatization and relegation that they may experience. The values carried out by the association are the horizontality of relationships, autonomy, no taking power over, no measuring of performances and no judgement. The street workshops of Mme Ruetabaga have been created as temporary autonomous zones (Bey, 1991), where one can experiment with liberty. Like Kropotkin, Mme Ruetabaga believes that a more harmonious way of life rooted in cooperation is possible and that through mutual aid one can have a different experience of the collective. We will now look at the space of the workshop. We will develop our argument that the workshops create a radically open space through the application of three spatial concepts: core, fringe and outer edge. The core of the workshops is where the activities take place, where the pedagogical material is stalled out and past productions are exposed, where tea is served. It is the visual attraction for newcomers and the permanent meeting point for regulars. The fringe is the transition space between what in- and what is outside of the workshops. We can think of the watchful eyes of parents from the apartment windows, the terrain used for ball games, hiding places at the margin of the workshop and finally benches or other objects where people sit together. At the fringe people participate indirectly in the workshop by their presence and occasional remarks. The outer edge is the space surrounding the workshops where things happen that do not directly enter into interaction with the activities except perhaps in case of conflict (scooters, a drifting soccer ball) or when they become part of the discussions of the participants. What keeps the workshops radically open is not so much that they take place in public space. After all, there are many closed groups that gather in public space. Rather, it is the creation of a space that has a mediation function between those in and outside. It therefore allows for the mixing of people and their roles and makes the space integrative. To explain how it works, we take the forest fringe as a metaphor. One of the key characteristics of the forest fringe is that it is porous: it is neither a limit nor a border that can only be crossed through defined and controlled passage. The fringe offers a multiplicity of opportunities for passage between the interior and exterior; the public and private; the known and unknown. Four types of displacement contribute to the formation of this fringe and thereby widen the outer edge of the workshop’s perimeter. The first itinerary is that of the cart from the office of Mme Ruetabaga to the Square of the Giants. This moving through the neighborhood allows to meet and greet children and their families, exchanging news and inviting them to join the workshops. The second itinerary is that of other volunteers, reaching the square from other directions but with the same social function. These displacements contribute to the connection between different spaces of public occupation. The third itinerary is that of small groups of children and volunteers during workshops to go and fetch material or water. These are occasions to accord specific attention to some children that ask for it. These are privileged moments to discuss, listen to confidences often linked to difficult periods in their lives. The fourth type of itinerary is that at the end of the workshops when the cart is returned to Mme Ruetabaga’s office and people depart in other directions. It is a moment of saying goodbye, letting go, reassuring that volunteers will come back and sometimes accompanying a child to their home in case a volunteer has identified specific needs of children. The end of the workshop constitutes a moment of tension. The group that has formed and has appropriated the public space is now going to be undone. We think of the workshops as a temporary densification of social relations. First there is one line, then different lines coming together, leading to a fusion of interactions, forming a group, which then is unraveled again. 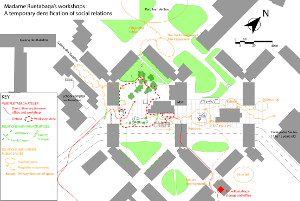 This densification of relations by inviting people into the fringe is demonstrated in map 3. An indirect relationship is created between the volunteers and the families without seeing each other. When a child descends from his apartment and steps into the street, it doesn’t meen that he’s left to himself. Each child has indications from caretakers which limits are not to be crossed. In most cases they coincide with the limits of view from the windows. This latent link can be actualised/mobilised in times of crisis. For example, once a recorder was stolen during the workshop, all families were visited to speak about the problem and to make them part of the solution. It did not take long before it was brought back. Beyond times of crisis, it also happens that parents themselves take the decision to step into the core of the workshops. For example one mother came to participate in the workshop after having watched for over 2 years. It was surprising to see that she knew exactly what was going on and that she even knew the names of the volunteers. Parents’ indirect participation is a guarantee for Mme Ruetabaga’s legitimacy. In addition to being linked to private spaces, the workhops are also connected to other spaces where groups of people gather. Each meeting place has its own function and public. There is for example a group of young men that gather in front of a kebab snackbar, families (mostly mothers) with small children are on benches around a small playground, children that look for niches to play ball games. People circulate between these spaces and thereby create links, which equally can be mobilised in times of crisis (example of recorder that has been previously mentioned). Children participating in the workshops also voluntarily explore the link between these different spaces during a community radio project. Children set out with a recorder to interview people in the neighborhood about a specific topic. It is an opportunity to invest areas that are usually off limits for them and feel legitimate about it. One time, when visiting the kebab snackbar they were made to feel that they were not at their place . This became an occasion for a group discussion about access to public space with the children concerned. Over the period of two hours the space of the square is made more public. (Mitchell, 2003; Staeheli and Mitchell, 2008). Madame Ruetabaga does not occupy the square but through its presence, it contributes to the actualisation of publicity. What does this collective presence in public allow? In what sense is it a rupture with the time outside of workshop? a) During the time of the workshop, the force of the group obtains that scooters slow down, that children obtain greater freedom of movement. Moreover, at times, during conversations participants speak up about a difficulty they meet. The association offers social and political accompaniment in individual cases, connecting families to networks that might improve the situation/problem of a family. b) The space of the workshop is also used to make collective claims : for the installation of a swing; for project funding. It has for example obtained access to the kitchen of the highly regulated Neighborhood Community House as well as to a restricted community garden bypassing red-tape. It can make these claims as a result of its local legitimacy and the indirect links that have been demonstrated earlier. c) A place of public expression: community radio, speak out about political events it is part, notably after last November terrorist attacks and neighborhood events. While the workshops do not particularly focus on gender equality, as a space to promote horizontal relations and it which children can experiment with different roles, girls and boys can seize the opportunity to address gender inequality, as for example Safia did. She told the volunteers during the workshop that the boys had refused her access to the soccer field and that she was relegated to play with the small kids (where?) although she is a very gifted soccer player. For the same reason the boys have not accepted her in the local football club. When asked what she wanted to do about this, she suggested the organisation of a soccer tournament. A match was improvised with shopping carts as goal in the space in front of Mme Ruetabaga’s office in which all could participate. This article is the Presentation at the Annual Conference of the RGS-IBG London, 31 August 2016. La recherche qui a menée à cette fiche a été possible grâce au soutien financier de la Région Auvergne-Rhône-Alpes.